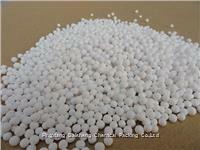 Activated Alumina absorbent has much micro-paths, so the specific surface is large. It can be used as absorbent desiccant and catalyst carrier. water, oxide, acetic acid, alkali etc. defluorination effect of the actived alumina is good. The capacity is stable, the absorbed fluorine is 6400g/cm3. material, such as H2S, SO2, HF and paraffin in the water gas, especially in the drinking water defluorination.